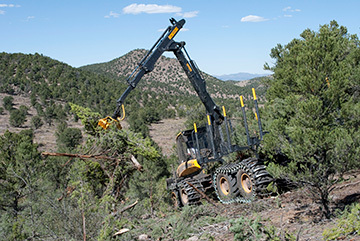 As part of a coordinated effort for managing Greater sage-grouse habitat, thousands of acres of pinyon and juniper woodlands (PJ) have been targeted for removal on lands managed by the Bureau of Land Management (BLM) and the U.S. Forest Service (USFS). These efforts provide a unique opportunity to study the biodiversity impacts of PJ removal across the Great Basin. While it is clear that expanding conifer canopies result in substantial decreases in plant species richness and abundance and that removing or thinning PJ often results in reversing those decreases, little is known about the broader effects of PJ removal on non-target wildlife populations. PJ woodlands provide critical habitat for many bird species, and these woodlands have been shown to enhance regional bird diversity. Use of PJ habitats by small non-flying mammals has also been well studied, but similar studies are lacking for other ecologically important taxa, including bats and reptiles. Insects provide critical ecosystem services (e.g., pollination), comprise a major proportion of faunal biodiversity and biomass in most ecosystems, and generally serve as foundational species by representing the chief food resource for many wildlife species, including bats and reptiles. Many insect species depend on specific plant species and attributes of vegetation structure, and as a result insect diversity and abundance can be very sensitive to local and regional habitat alterations. Research into native bees has become a research priority due to the critical pollination services they provide (e.g., Presidential Memorandum on Health of Honey Bees and Other Pollinators [June 20, 2014] and the subsequent Pollinator Research Action Plan [May 19, 2015]. Furthermore, insects, in particular Lepidoptera and Hymenoptera, serve as critical food resources for Greater sage-grouse chicks and are likely primary drivers of recruitment and brood population dynamics. Therefore, measuring the effects of PJ removal on insect communities is critical to meeting the obligations identified under Greater sage-grouse land management guidance documents. The insects of the Great Basin in turn support an impressive diversity of aerial and terrestrial vertebrate predators, including bats and reptiles. These insectivores serve critical roles in structuring ecosystems through mechanisms such as trophic cascades. Nonetheless, little is known about the habitat use and disturbance tolerance of vertebrate predators of insects in the Great Basin – especially bats and reptiles. Bat diversity and abundance is likely to be sensitive to habitat alterations at large, regional scales (i.e., hundreds of hectares), as even the smallest species are capable of moving hundreds of kilometers in the course of their seasonal movements. However, little is known about habitat use and disturbance tolerance for most bat species. Overall a total of 16 bat species are known to occur throughout the study region, at least 7 of which are likely to be widely detectable throughout the study region. Some bat species (e.g., Antrozous pallidus, Myotis thysanodes) may benefit from removal of PJ woodlands (e.g., cleared areas may improve foraging success), while other bat species (e.g, Corynorhinus townsendii, Myotis evotis, Lasiurus cinereus) may be negatively impacted by tree removal via loss of summer or winter roosting sites. In addition to performing critical ecological functions, bats save the agriculture industry billions annually by consuming substantial insect biomass each night. Bats can serve as sensitive ecological indicators, in part because the loss of any one of their diverse resource requirements, which may include distinct roosting sites, water sources, and foraging areas, may result in rapid population decline. Reptiles are also very likely to serve as useful indicators of the effects of PJ treatments on small-bodied, dispersal-limited wildlife. Reptile home ranges, in sharp contrast with bats, are typically small in area (often less than one hectare) and reptiles, being cold blooded, may be particularly sensitive to changes in thermal regimes on a microsite scale. Reptiles represent an understudied and ecologically important component of wildlife diversity in the Great Basin, and some species could conceivably be positively impacted by PJ removal, while others potentially negatively impacted. Nine species of lizards are known to occur in the study region, at least eight of which are likely to be encountered in sufficient numbers for statistical analysis. Species likely to benefit from removal of woody cover include Collared Lizard, Western Whiptail, and Long-nosed Leopard Lizard. Species that may be negatively affected by removal of PJ woodlands include Western Skink and possibly Sagebrush Lizard. Test the effects of planned pinyon and juniper woodland removal treatments on insect communities and the reptile and bat species that depend upon them, using a rigorous before-after-control-impact experimental design that spans the Great Basin in Nevada. This project will also identify environmental factors (e.g., vegetation structure, microclimate) driving observed multi-species responses. Barnett, J. K., & Crawford, J. A. (1994). Pre-Laying Nutrition of Sage Grouse Hens in Oregon. Journal of Range Management, 47(2), 114. Bateman, H. L., & Ostoja, S. M. (2012). Invasive woody plants affect the composition of native lizard and small mammal communities in riparian woodlands. Animal Conservation, 15(3), 294–304. Bates, J. D., & Svejcar, T. J. (2009). Herbaceous Succession After Burning of Cut Western Juniper Trees. Western North American Naturalist, 69(1), 9–25. Bates, J. D., Miller, R. F., & Svejcar, T. J. (2000). Understory Dynamics in Cut and Uncut Western Juniper Woodlands. Journal of Range Management, 53(1), 119. Boyles, J. G., Cryan, P. M., McCracken, G. F., Kunz, T. H., & others. (2011). Economic importance of bats in agriculture. Science, 332(6025), 41–42. Braak, C. J. F. T. (1986). Canonical Correspondence Analysis: A New Eigenvector Technique for Multivariate Direct Gradient Analysis. Ecology, 67(5), 1167–1179. Brehm, G., & Axmacher, J. C. (2006). A comparison of manual and automatic moth sampling methods (Lepidoptera: Arctiidae, Geometridae) in a rain forest in Costa Rica. Environmental Entomology, 35(3), 757–764. Brockway, D. G., Gatewood, R. G., & Paris, R. B. (2002). Restoring grassland savannas from degraded pinyon-juniper woodlands: effects of mechanical overstory reduction and slash treatment alternatives. Journal of Environmental Management, 64(2), 179–197. Castro-Luna, A. A., Sosa, V. J., & Castillo-Campos, G. (2007). Quantifying phyllostomid bats at different taxonomic levels as ecological indicators in a disturbed tropical forest. Acta Chiropterologica, 9(1), 219–228. Dahlgren, D. K., Messmer, T. A., & Koons, D. N. (2010). Achieving Better Estimates of Greater Sage-Grouse Chick Survival in Utah. The Journal of Wildlife Management, 74(6), 1286–1294. Davies, K. W., Boyd, C. S., Beck, J. L., Bates, J. D., Svejcar, T. J., & Gregg, M. A. (2011). Saving the sagebrush sea: An ecosystem conservation plan for big sagebrush plant communities. Biological Conservation, 144(11), 2573–2584. Deutsch, C. A., Tewksbury, J. J., Huey, R. B., Sheldon, K. S., Ghalambor, C. K., Haak, D. C., & Martin, P. R. (2008). Impacts of climate warming on terrestrial ectotherms across latitude. Proceedings of the National Academy of Sciences, 105(18), 6668–6672. Dial, R., & Roughgarden, J. (1995). Experimental Removal of Insectivores from Rain Forest Canopy: Direct and Indirect Effects. Ecology, 76(6), 1821–1834. Drut, M. S., Pyle, W. H., & Crawford, J. A. (1994). Diets and Food Selection of Sage Grouse Chicks in Oregon. Journal of Range Management, 47(1), 90–93. Fisher, R. N., and C. J. Rochester 2012. Pitfall-Trap Surveys. Pages 234-249 in R. W. Mcdiarmid, M. S. Foster, C. Guyer, J. W. Gibbons and N. Chernoff, editors. Reptile Biodiversity: Standard Methods for Inventory and Monitoring. University of California Press, Berkeley. Forbis, T. A., Provencher, L., Turner, L., Medlyn, G., Thompson, J., & Jones, G. (2007). A Method For Landscape-Scale Vegetation Assessment: Application to Great Basin Rangeland Ecosystems. Rangeland Ecology & Management, 60(3), 209–217. Forister, M. L. (2009). Anthropogenic Islands in the Arid West: Comparing the Richness and Diversity of Insect Communities in Cultivated Fields and Neighboring Wildlands. Environmental Entomology, 38(4), 1028–1037. Francis, C. D., Ortega, C. P., & Hansen, J. (2011). Importance of juniper to birds nesting in piñon–juniper woodlands in northwest New Mexico. The Journal of Wildlife Management, 75(7), 1574–1580. Godley, J. S. 2012. Sampling with Artificial Cover. Pages 249-255 in R. W. Mcdiarmid, M. S. Foster, C. Guyer, J. W. Gibbons and N. Chernoff, editors. Reptile Biodiversity: Standard Methods for Inventory and Monitoring. University of California Press, Berkeley. Greenberg, C. H., Neary, D. G., & Harris, L. D. (1994). A Comparison of Herpetofaunal Sampling Effectiveness of Pitfall, Single-Ended, and Double-Ended Funnel Traps Used with Drift Fences. Journal of Herpetology, 28(3), 319–324. Gregg, M. A., & Crawford, J. A. (2009). Survival of Greater Sage-Grouse Chicks and Broods in the Northern Great Basin. The Journal of Wildlife Management, 73(6), 904–913. Guyer, C., and M. A. Donnelly 2012. Visual Encounter Surveys. Pages 218-220 in R. W. Mcdiarmid, M. S. Foster, C. Guyer, J. W. Gibbons and N. Chernoff, editors. Reptile Biodiversity: Standard Methods for Inventory and Monitoring. University of California Press, Berkeley. Hodkinson, I. D., & Jackson, J. K. (2005). Terrestrial and Aquatic Invertebrates as Bioindicators for Environmental Monitoring, with Particular Reference to Mountain Ecosystems. Environmental Management, 35(5), 649–666. Huey, R. B., Kearney, M. R., Krockenberger, A., Holtum, J. A. M., Jess, M., & Williams, S. E. (2012). Predicting organismal vulnerability to climate warming: roles of behaviour, physiology and adaptation. Phil. Trans. R. Soc. B, 367(1596), 1665–1679. Marquis, R. J., & Whelan, C. J. (1994). Insectivorous Birds Increase Growth of White Oak through Consumption of Leaf-Chewing Insects. Ecology, 75(7), 2007–2014. McDiarmid, D. R. W., Foster, D. M. S., Guyer, D. C., Gibbons, D. J. W., & Chernoff, D. N. (2012). Reptile Biodiversity: Standard Methods for Inventory and Monitoring. University of California Press. Medellín, R. A., Equihua, M., & Amin, M. A. (2000). Bat Diversity and Abundance as Indicators of Disturbance in Neotropical Rainforests. Conservation Biology, 14(6), 1666–1675. Miller, R. F., and R. J. Tausch 2001. The role of fire in pinyon and juniper woodlands: a descriptive analysis. Proceedings of the Invasive Species Workshop: the Role of Fire in the Control and Spread of Invasive Species. Fire Conference 2000: the First National Congress on Fire Ecology, Prevention, and Management. Miscellaneous Publication No. 11, Tall Timbers Research Station, Tallahassee, FL.:15-30. Morrison, E. B., & Lindell, C. A. (2012). Birds and bats reduce insect biomass and leaf damage in tropical forest restoration sites. Ecological Applications, 22(5), 1526–1534. Norquay, K. J. O., Martinez-Nuñez, F., Dubois, J. E., Monson, K. M., & Willis, C. K. R. (2013). Long-distance movements of little brown bats (Myotis lucifugus). Journal of Mammalogy, 94(2), 506–515. Rodhouse, T. J., Ormsbee, P. C., Irvine, K. M., Vierling, L. A., Szewczak, J. M., & Vierling, K. T. (2015). Establishing conservation baselines with dynamic distribution models for bat populations facing imminent decline. Diversity and Distributions, 21(12), 1401–1413. Royle, J. A., & Dorazio, R. M. (2008). Hierarchical Modeling and Inference in Ecology: The Analysis of Data from Populations, Metapopulations and Communities. Academic Press. Setser, K., Meik, J. M., & Mulcahy, D. G. (2002). Herpetofauna of the southern Snake Range of Nevada and surrounding valleys. Western North American Naturalist, 62(2), 234–239. Stebbins, R. C. (2003). A Field Guide to Western Reptiles and Amphibians. Houghton Mifflin Harcourt. Williams, J. A., O’Farrell, M. J., & Riddle, B. R. (2006). Habitat use by bats in a riparian corridor of the Mojave desert in southern Nevada. Journal of Mammalogy, 87(6), 1145–1153. Wisdom, M. J., & Chambers, J. C. (2009). A Landscape Approach for Ecologically Based Management of Great Basin Shrublands. Restoration Ecology, 17(5), 740–749.